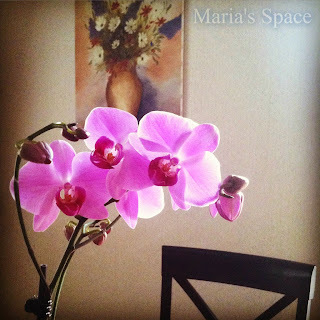 This Mother's Day I received an Orchid or Orchidaceae from my husband. It is a beautiful flower. OK, so there was no card but it was a really nice gesture. Here it is in front of a picture I painted back in the 90s. It is a lovely flower and I pray I can keep it alive. It takes only 3 ice cubes a week. I've never watered a plant by adding ice but sounds easy enough. Does anyone have heard of using ice for orchids?